The JORC 2016 resource report quotes – “Samples collected at Guayatayoc and Vilama have lithium and boron values in the range that would be considered exceptionally commercial.” Guayatayoc appears to have excellent chemistry with very low magnesium to lithium ratios. AIS Resources market cap is about 4x lower than peers at a similar stage. AIS Resources is a Canadian junior lithium explorer and developer fast tracking towards production at their 100% owned flagship Guayatayoc salar in Argentina. Highly experienced COO and Geologist for AIS Resources Phillip Thomas says that “Guayatayoc is in the best 5 Argentina salars that can supply the world” with lithium. He also says he has explored all 52 of Argentina’s salars and he recognizes the key importance of having a favorable brine chemistry (particularly being low in magnesium). 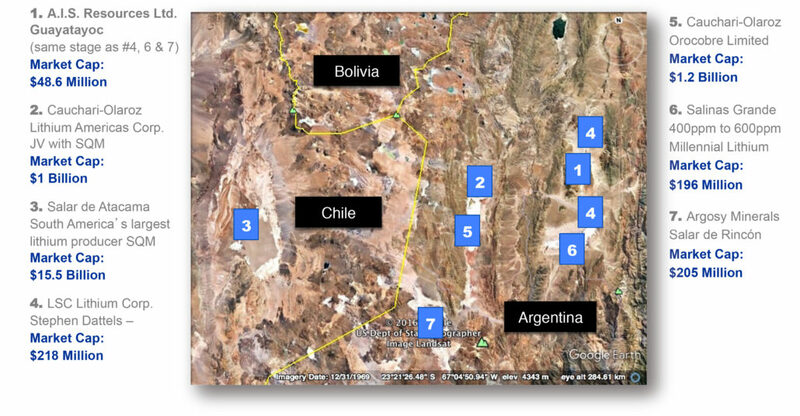 AIS Resources has bought options to buy into their lithium brine concessions in Argentina, and is currently completing assessment of these tenements towards a BFS by mid to late 2018. They have already built a pilot plant and a chemistry lab, so are already quite advanced. 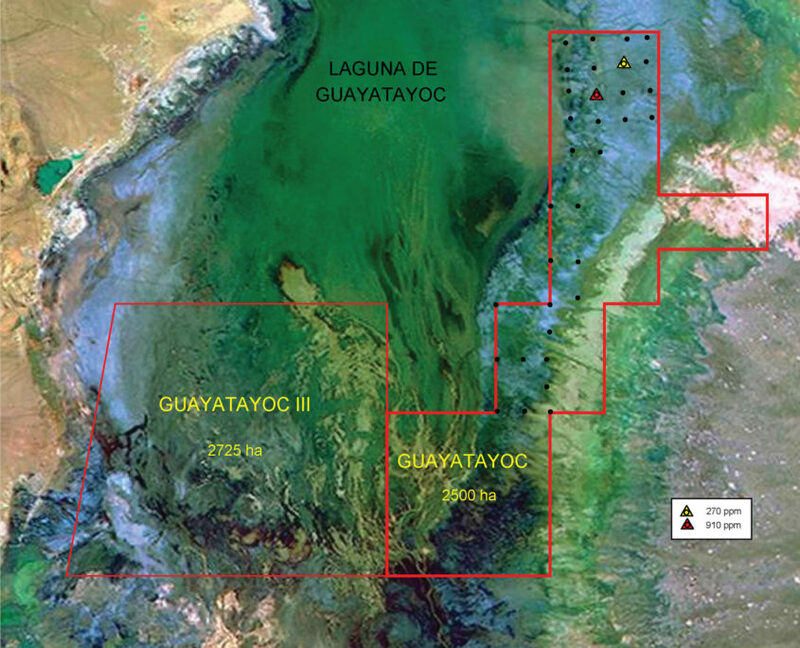 Guayatayoc (Jujuy Province) – 2,725 hectares. Guayatayoc III (Jujuy Province) – 2,500 hectares. Vilama (Jujuy Province) – 2,500 hectares. Note: Guayatayoc has a mining permit. A drilling permit was expected by Dec. 2017. Guayatayoc is located north of Salinas Grandes and about 269km by road from the City of Salta. The western boundary of the concession is approximately 3km from the road. From Salta there is a train to the port. 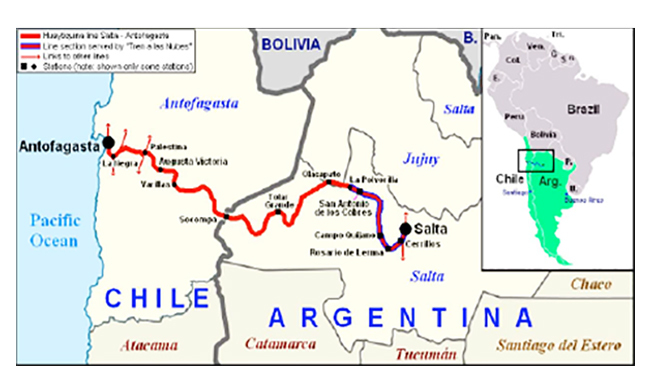 There is also a railway crossing from Northern Argentina to Chile that passes approximately 80km south of the Guayatayoc project. A gas pipeline runs across the top and the bottom of the concession area. There is a terminus about 5km from the turnoff on the road to Guayatayoc. There are 240V and 345Kva lines within 3km of the project. The roads are in very good condition and sealed nearly all the way to Salta after the first 46 km. There are numerous freshwater springs on the hills surrounding the Guayatayoc concessions. The Pistrani works camp is also close by that provides heavy engineering support and services. The closest petrol station and supplies are located at Purmamarca (population about 2,000 plus about 500 tourists) which is 85km south or approximately 1.5 hours’ drive. Laguna Vilama is situated on a road that leads into Bolivia, and has minimal infrastructure, being located approximately 170km from Susques. Susques is the nearest town and supplies of gas, food and labor would need to be trucked in or out. The project has advanced quickly due to acquiring a 2013 PhD study and 2015 follow up paper completed by Dr. Romina Steinmetz, which saved a lot of exploration cost and time (~2-3 years). Previous exploration on the property has returned lithium grades between 200 ppm and 800 ppm of lithium. The magnesium to lithium ratios are less than 4 to 1, excellent for low cost processing. Due to favorable brine chemistry (minimal deleterious elements), the company has been able to achieve excellent recoveries of 78% lithium carbonate. 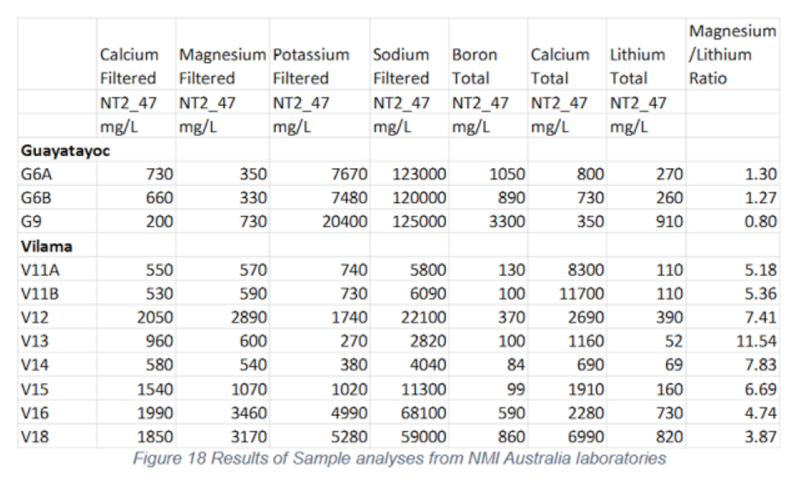 Significant boron and potassium are present and can be valuable by-products. President, CEO, Director – Marc Enright-Morin is a successful mining and investment banking executive based in Vancouver. He has assisted various public and private companies raise capital through numerous institutions throughout North America, Europe and Austral-Asia. He has over 15 years experience in the public and private markets with extensive network of investment banking contacts, all instrumental in the management and development of junior companies. He has assisted various companies to go public through RTOs and IPOs, and has served as an officer and director to a number of publicly traded mining companies. His primary focus is the resource sector – with seven years spent acquiring, researching, drilling and raising capital specifically for lithium opportunities. COO, Director, Project Director/Geologist – Phillip Thomas, BSc Geol, MBusM, MAIG, MAIMVA, (CMV) has spent the past 12 years exploring for lithium brines, building and operating pilot plants for production, and building production and processing facilities. He has firsthand experience with the highly technical process of operating a lithium carbonate / lithium chloride plant at the Rincon salar. He was Chairman and CEO of Admiralty Resources from 2004 to 2008, where he and his team explored and built the lithium carbonate processing facility which commenced operation in 2007. Upon the sale to the Sentient group in 2008, he resigned to pursue other lithium development opportunities. He and this team developed the Pozuelos salar producing an indicated and inferred resource, and putting in two production wells. 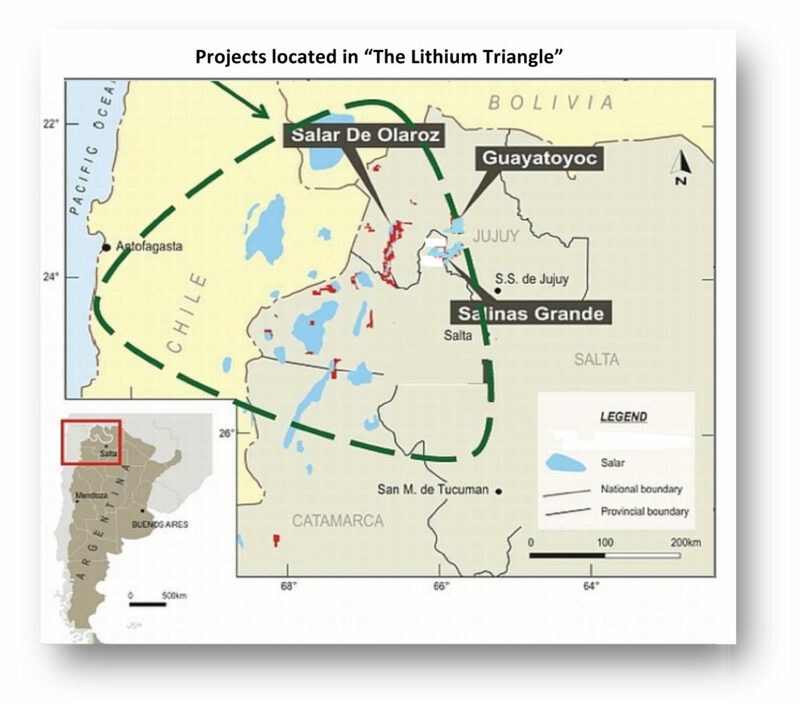 At Hombre Muerto salar they trenched, drilled and constructed the lithium isobars, including putting together a fully equipped lab and pilot plant in Salta to manage the extraction processes and phase chemistry including fractional crystallization, membranes and ion exchange processes. Most recently he’s been involved in exploring the Pocitos, Salinas Grandes and Guayatayoc salars. He is an experienced Geologist both in the field and has written bankable feasibility studies and proven and probable resource estimate statements. Has significant investment banking experience holding senior executive/director roles with Macquarie Bank, ABN-Amro, McIntosh Securities and actuaries Watson Wyatt. Chief Chemical Engineer – Dr. Carlos Sorentino is a highly experienced lithium developer. From 1996 to 2001, he prepared detailed engineering and bankable feasibility study for exploitation of the Salar del Rio Grande. From 2004 to 2008, he developed the basic and detail engineering and directed the establishment of a pilot plant for a lithium project in the Salar of Rincon, in Salta, Argentina. Recently, he formulated a detailed business plan for the exploitation of lithium in the Salar of Pozuelos. AIS Resources currently has a market cap of CAD 62m, with a very tight register of just 48.18 million shares outstanding (added to this is ~1.2m warrants as of November 2017). Note: LSC Lithium Corporation (51%) has partnered with Dajin resources (49%). LSC Lithium has agreed to spend $2,000,000 to earn a 51% interest in Dajin S.A.’s land holdings. These mineral concessions exceed 93,000 hectares (230,000 acres) and are primarily located in the Salinas Grandes/Guayatayoc salt lakes basins (salar), Argentina. My very preliminary model (not to be relied on yet) values AIS Resources with a price target of CAD 2.07 (1.6 x higher) if they can successfully make it to become an 8,000 tpa LCE producer (current company guidance) by end 2020. More than likely they will expand to say 16,000 tpa LCE. If they reach this level by say end 2021 my preliminary price target moves to CAD 4.89 (3.8 x higher). 2018 – Geophysical and drill results, followed by a NI43-101 Inferred and possibly Indicated mineral resource statement. 2018 – BFS, followed by project fund raising, off-take partners. 2019/2020 – Commence lithium production. The current lithium producers SQM (SQM), Albemarle (ALB), FMC Corp. (NYSE:FMC)), Orocobre [ASX:ORE] (OTCPK:OROCF), Tianqi Lithium (SHE:002466), Jiangxi Ganfeng Lithium (SHE:002460), Galaxy Resources [ASX:GXY] (OTCPK:GALXF), Mineral Resources [ASX:MIN], and Neometals [ASX:NMT] (OTC:RRSSF). The near-term producers include Altura Mining [ASX:AJM] (OTCPK:ALTAF), Pilbara Minerals [ASX:PLS] (OTC:PILBF), Tawana Resources [ASX:TAW], AMG Advanced Metallurgical Group NV [NA:AMG][GR:ADG](OTCPK:AMVMF), Kidman Resources [ASX:KDR], Critical Elements [TSXV:CRE] (OTCQX:CRECF), Nemaska Lithium (OTCQX:NMKEF) [TSX:NMX], Lithium Americas [TSX:LAC] (OTCQX:LACDF), Lithium X [TSXV:LIX] (OTC:ROCEF), European Metals [ASX:EMH] (OTCPK:MNTCF), Neo Lithium Corp [TSX:NLC] (OTC:NTTHF), Bacanora Minerals [TSXV:BCN] (OTC:BCRMF), Lithium Power International [ASX:LPI] (OTC:LTHHF), Advantage Lithium [TSXV:AAL] (OTCQB:AVLIF), Millennial Lithium Corp [TSXV:ML] (OTCQB:MLNLF), AVZ Minerals [ASX:AVZ] (OTC:AZZVF), International Lithium Corp [TSXV:ILC] (OTCPK:ILHMF), Sayona Mining [ASX:SYA] (OTC:DMNXF), Pure Energy Minerals [TSXV:PE] (OTCQB:PEMIF), Wealth Minerals [TSXV:WML] [GR:EJZN] (OTCQB:WMLLF), Birimian Ltd [ASX:BGS] (OTC:EEYMF), LSC Lithium [TSXV:LSC] (OTC:LSSCF)/Dajin Resources [TSXV:DJI] (OTCPK:DJIFF) and Piedmont Lithium [ASX:PLL] (OTC:PLLLY). The usual mining risks – Funding, permitting, off-take, production issues etc. Stock dilution, liquidity risk (best to buy on local exchanges). Investors can view the November 2017 company presentation here. Also I would highly recommend watching the following AIS interview video here. AIS Resources were previously not easily investable trading under the TSX-H ticker, and have only recently become more accessible to investors; hence the stock price has risen recently. AIS Resources strength lies in their very experienced management especially Phillip Thomas, who has explored all 52 of Argentina’s salars, and worked previously to develop the Rincon salar, the Pozuelos salar, Hombre Muerto salar, and the Pocitos, Salinas Grandes and Guayatayoc salars. Experience does not come any better than that, especially in the lithium sector. Valuation is still very attractive due to the early stage, with a current market cap of a mere CAD 62 million, around 4x cheaper than comparable peers at a similar stage. AIS Resources already has some excellent results from their flagship Guayatayoc salar, plus has exposure to three different salars (Guayatayoc, Vilama, Quinos Salar), and is fast tracking progress towards production. Given the above facts and the very low market cap AIS Resources appear to be an excellent speculative lithium buy right now. My only thought to understand why they are still so cheaply valued is that the stock was held back previously due to not being listed properly on the TSXV and US OTC, and perhaps has not received the same promotion. A 2018 resource announcement followed by a BFS, then progress towards funding, off-takes and production, should all serve as catalysts to drive the stock price much higher towards my preliminary price targets. I would be a buyer now, and would look to accumulate as they progress to de-risk the project. As usual all comments are welcome. Disclosure: I am/we are long NYSE:ALB, NYSE:SQM, ASX:ORE, ASX:GXY, ASX:PLS, TSX:LAC, ASX:AJM, ASX:EMH, TSXV:ILC, ASX:AVZ, ASX:LPI, ASX:PLL, ASX:SYA., TSXV:AIS, TSXV:WML. I wrote this article myself, and it expresses my own opinions. I am not receiving compensation for it. I have no business relationship with any company whose stock is mentioned in this article. Additional disclosure: The information in this article is general in nature and should not be relied upon as personal financial advice. Canadian junior lithium explorer and developer optioned to buy into several promising lithium salars in Argentina.